There's a bug in your garden, but is it a good bug or a bad bug? 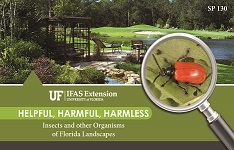 Reaching for this handy, full-color guide can help you identify and understand the ecological roles of many important groups of insects and other small organisms common to Florida landscapes. For purchases of 25+ copies, please call us at 800-226-1764 or email ifasbooks@ifas.ufl.edu to inquire about a 20% bulk purchase discount!